On the East Coast snow depths are typically 60-120cm (2-4 feet), which is considered a healthy base in the area. They're not much different at Colorado's resorts, where the stats are less impressive due to the usual abundance of snow in the leading US ski state. In both Canada and the US the heaviest snow of the past week and the deepest bases are on the far West Coast. In the US, Squaw Valley in California has seen the second wave in an ongoing series of winter storms has leave over two feet (60cm) more snow in the past 48 hours. Recurring storm waves are forecast to continue for the next few days, delivering several feet of additional snow and setting up the resort with exceptional conditions into the core of the season ahead. The resort has received 17 feet (over five metres) of snow so far this season and is 100% open. In Canada the latest storm to hit Whistler Blackcomb has dumped 70 centimetres (28 inches) in 24 hours at the weekend, immersing the resort in deep winter conditions. Although the heavy snow and high winds prevented a number of lifts from opening until conditions improved. 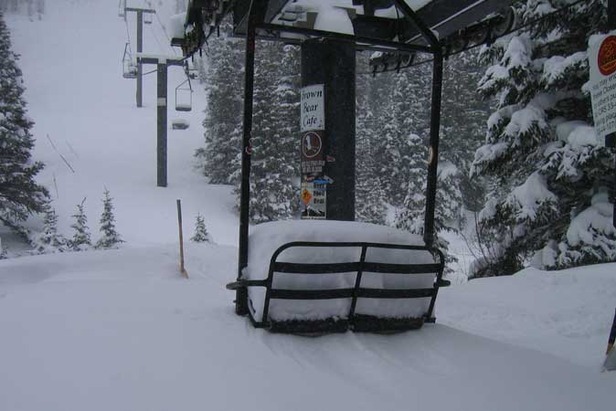 Other resorts in British Columbia have also been reporting big snowfalls. "Even with all the snow this year, this latest storm was one of the most intense we've dealt with in a long time," said Doug MacFarlane, Whistler Blackcomb's mountain manager. "Ski Patrol has been conducting extensive avalanche control work, and Operations crews have been working throughout the night and day digging out. For those guests who endured the storm, the rewards were plentiful as there were many fresh tracks to be had." The snow base is on the verge of reaching three metres or 9.8 feet. With the 2010 Olympic & Paralympic Winter Games now less than a month away, the resort is primed ready to welcome the world to its snowy slopes.